As stated in my previous post, an Asian Skincare Routine does not necessitate the use of only Asian products. That said, the first product I will be reviewing is CeraVe PM, a Western moisturizer that is very popular among members of the Asian Beauty subreddit due to its multitasking properties, low price point, and availability. As per their name, CeraVe produces a number of skincare products which contain ceramides. Ceramides are found on the skin’s outermost layers (also known as the stratum corneum or “moisture barrier”), which is responsible for protecting the skin against the environment and keeping it moisturized. Skin lacking ceramides can exhibit dryness and irritation. What sets CeraVe PM apart is that it not only contains ceramides, but other moisturizing and wrinkle reducing ingredients such as Hyularonic Acid and Niacinamide. 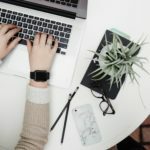 For those of you looking for an affordable multitasker, CeraVE is for you! I started spot testing Cerave PM on the right side of my face, using it as the last step of my skincare routine at night and before sunscreen in the morning. The consistency of the moisturizer is similar to a watered down lotion, but seemed to provide enough hydration given my oily skin. The first few days of using CeraVe PM, I didn’t seem to notice much difference between the left and right side of my face. However, by day four I noticed that the right side of my face (with the CeraVe PM) was significantly oilier than the left. The right side of my face also had a tingling, almost slight burning sensation that would linger throughout the day. 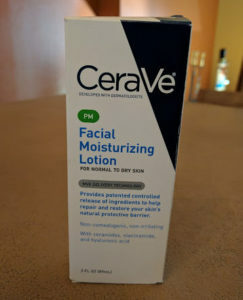 After consulting with the Asian Beauty subreddit, I promptly discontinued using CeraVe PM as I was told that no product should make my face feel that way. As much as I wanted to like CeraVe PM, it just didn’t seem to work for my skin. I consider myself lucky that with the extra oiliness and irritation, I somehow ended up not breaking out. This definitely reinforces the importance of doing a patch test when trying out new skincare products! Everyone’s skin is different. Given the low cost and availability of Cerave PM, I’d definitely recommend giving it a try. If it works for your skin, you’ll have found a solid, mulitasking product! You can find Cerave PM at Amazon, Target, Ulta, and pretty much every drug store.